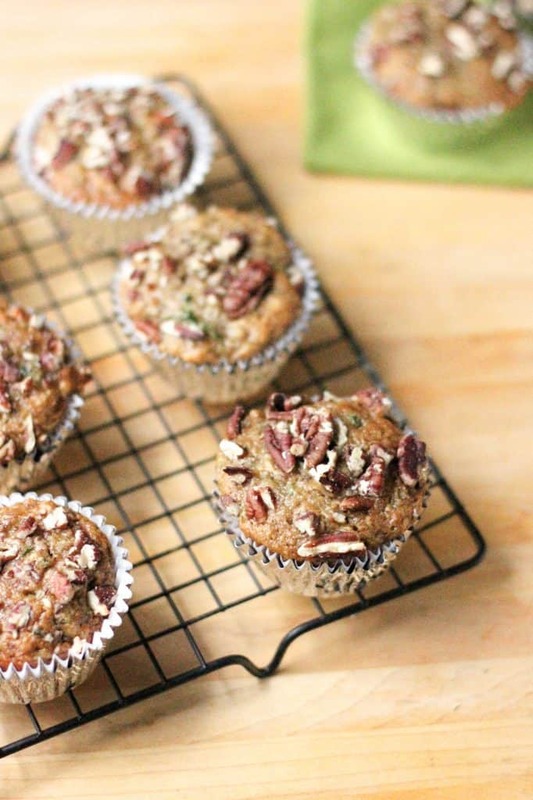 These Zucchini Banana Muffins bring zucchini bread and banana bread together into one delicious, moist, healthy muffin. Pecans add a nice contrasting crunch. These muffins were inspired by an overabundance of produce and desire to make some slightly lighter baked goods. Despite being on the lighter side, they do not disappoint in the flavor department. They’re slightly sweet, and also super moist. These muffins were inspired by the recipe on Mix and Stir. Preheat the oven to 350 degrees F. Line a muffin tin with paper liners. Set aside. In a medium mixing bowl, whisk together the flour, cinnamon, baking soda, and salt. Set aside. In a large mixing bowl, mash the banana with a fork. Add the sugar, applesauce, and vanilla extract, stirring with a spatula to combine. Add the zucchini and mix to combine again. Little by little, add the dry ingredients to the wet. Mix until just combined. Gently fold in the chopped nuts. Fill the muffin cups about 3/4 of the way full with batter. Sprinkle the top generously with chopped nuts. Bake 20-25 minutes, or until a knife/toothpick, when inserted in the center comes out clean. Allow the muffins to cool in the pan for 5 minutes before removing them to a wire rack to cool completely. Looking for other zucchini-based recipes? Coconut Zucchini Bread is great! How about a Cinnamon Zucchini Bundt Cake? What about some more muffins? Apple Oat Streusel Muffins, anyone?